The Nico van der Meulen Architects did a great job in reconstructing this old African Home that was mainly made of brick, vaulted roofing and small windows. The Aboo Makhado Residence or the House of Aboobaker is a great example of how a space is maximized to its full potential. The original living space was 343 sqaure meters and was increased to 494 square meters, thanks to the renovation done by this Johannesburg-based designers. 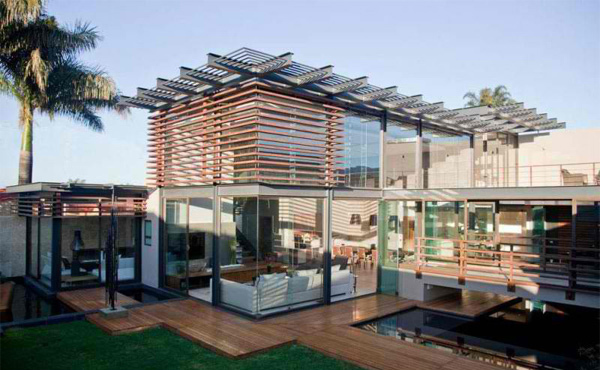 This modern contemporary almost transparent home was created to give more natural lighting that would make the home save more energy. 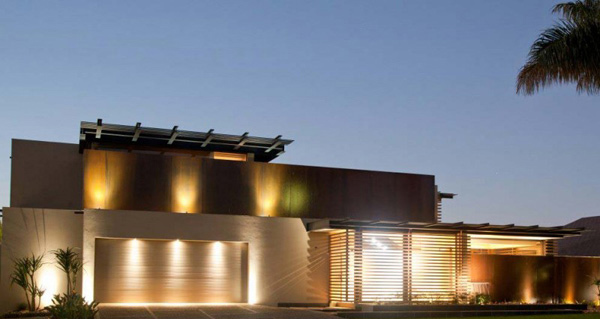 Also, this home is made of naturally rusted and sealed corten steel cladding and louvers especially done for places like Limpopo, South Africa. The idea of wrapping the house with water features and a swimming pool gave way in improving the cooling system the house actually needed. If you observe the following photos, the clients obviously wanted to widen the space by making sure the living areas are open and allowed everyone to see what the house has to offer. 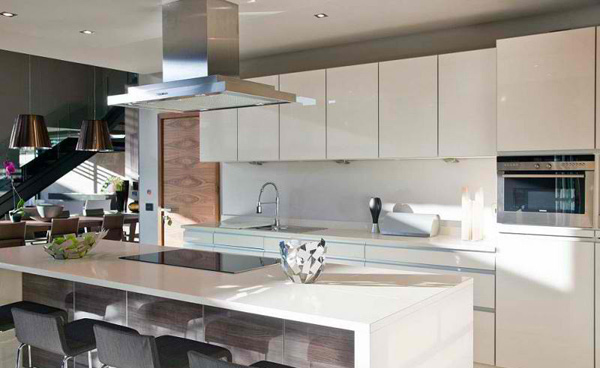 Check out how the designers made this spaces a marvelous example of a modern and chic home. 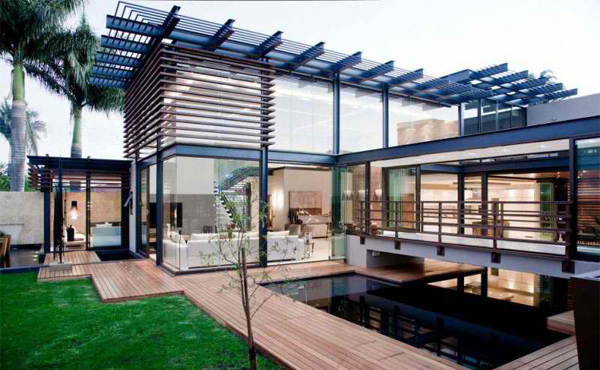 Observe how this house makes you feel when you look at it’s sleek lines and rustic colors. Check how the sun gives the entire house natural lighting and makes you see almost everything that is inside the house in one quick glance. In this photo, you get to imagine being surrounded with water plus a taste of the crisp air during the night. 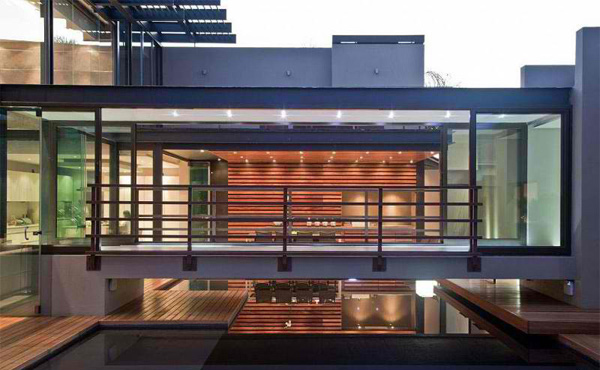 In this angle, the wooden trail created hugging the house giving it a more environment friendly feel. From this side of the house, you get to see a bedroom across the sort-of-bridge that was intended for crossing from one area of the house to the other. 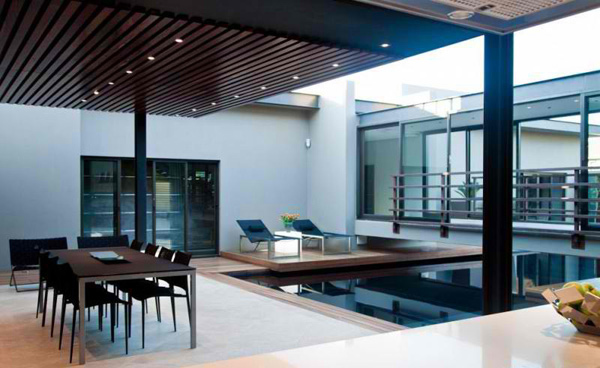 This image shows the outdoor dining area facing the water feature underneath a covering. This is one of the two dining areas in the house. 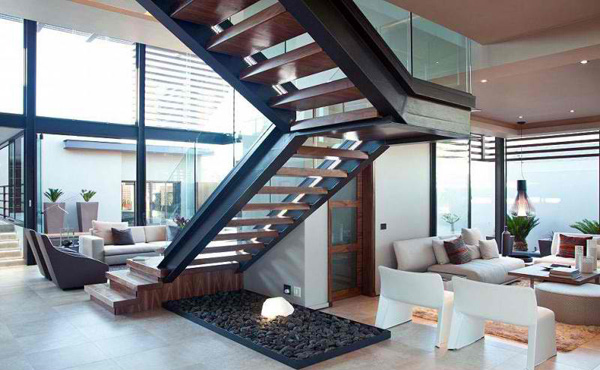 This stairs is primarily made of glass and dark wood which blends in with the colors for the pieces in the living area. In this picture, you get to tell that the space looks rather masculine because of the browns and blacks in it but the walls and the floors give it a more subtle look. 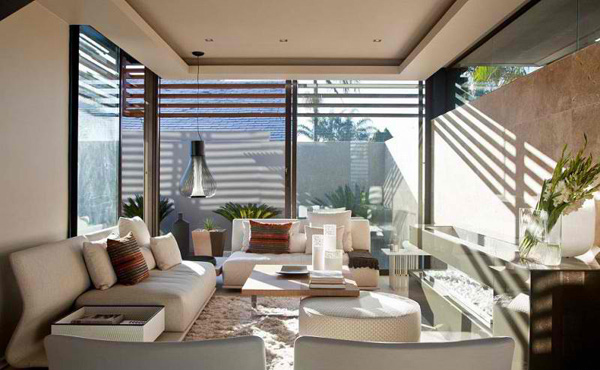 This area softens the entire house because of the light colors chosen both for the walls and the furniture. The kitchen are neatly done with beige and the dark stools give contrast to the entire look. 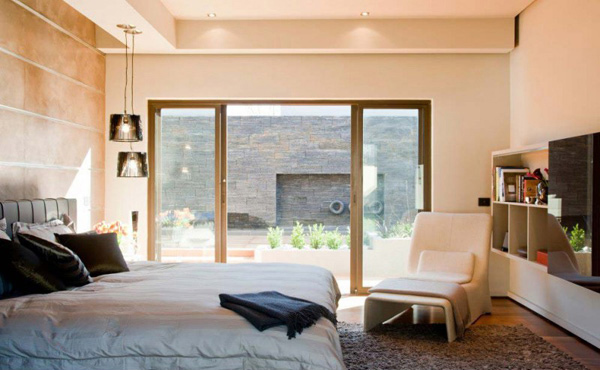 Like all the other places in the house, the bedroom is beside yet another water feature. The rooms is beige like most parts of the house. 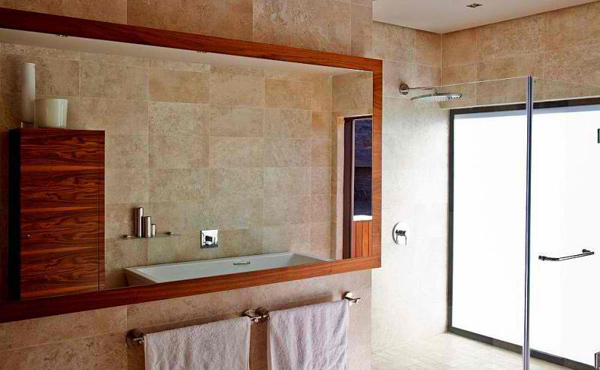 This toilet and bath is well lighted with modern fixtures which makes the space immaculate. This part of the house with the lighting during the night makes you think that the place is seen in a Hollywood movie. Speaking of a Hollywood movie, have you noticed the furnitures in the house? Super classy right? The decision of the home-owners in choosing neutral colors evidently made the places more classy and sophisticated. Choosing a smaller color palette with furniture sometimes makes or breaks the aura the owners wanted to achieve. And thanks to the wonderful choices of black, brown, beige and white, the house sure looks wonderful. 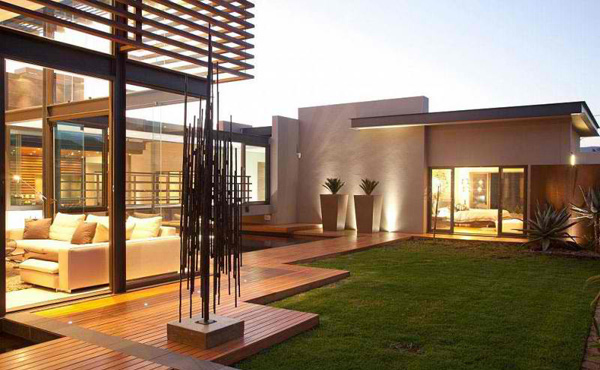 If we were in the owner’s shoes, we would like to believe that everything that they hoped for and wanted for a home was achieved by the designers from Nico van der Meulen Architects. From maximizing their space and improving the lighting and heat controls and taking into consideration the eco-friendliness of the house. 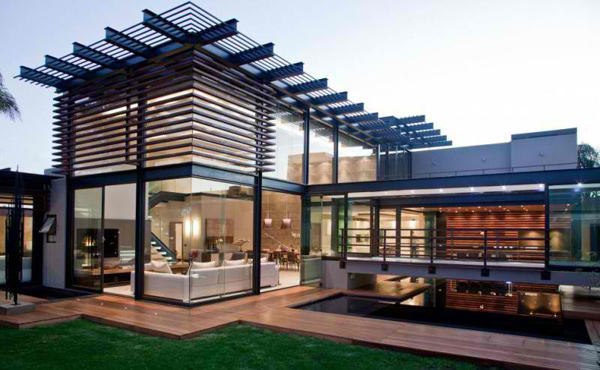 For more information on the makers of Aboobaker House or the Aboo Makhado Residence, you can visit Nico van der Meulen Architects.